Pioneer DDJ-SX3 Versus Native Instruments Traktor Kontrol S4 MK3: Which Is the Best? The year is 2018, and it’s the year that Native Instruments finally decided their DJ ecosystem is still worth keeping around and thus not only released the brand new Traktor Pro 3 (review coming soon), but also no less than 2 brand new controllers: The Traktor Kontrol S4 MK3 and the Traktor Kontrol S2 MK3. In this head to head, we pick the S4 MK3 and pitch it against another similarly priced controller, but this time from the Pioneer DJ camp: the DDJ-SX3, also a third generation controller for Serato DJ Pro. Both being third generation gear means that the manufacturers had the time to perfect their product, and while the S4 MK3 is a radically different beast than its MK2 predecessor, the SX3 is more an update to the SX2 with a few (important) changes. 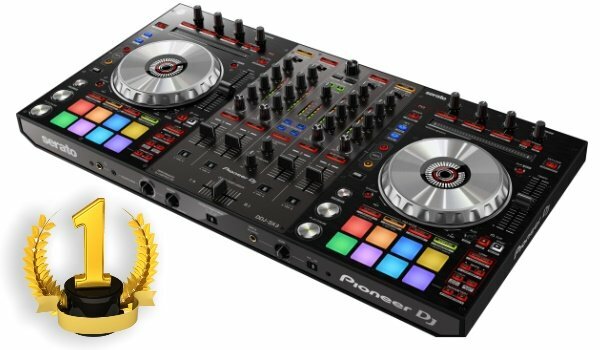 The Pioneer DJ DDJ-SX3 is one of the best equipped Serato DJ Pro controllers on the market, with excellent jog wheels, a 4 channel, DVS enabled mixer with built-in sound color effects and a professional grade input & output array. The Pioneer DJ DDJ-SX3 is the third generation of the extremely popular DDJ-SX controller from Pioneer. This time around, the SX3 has built-in sound color effects much like the Pioneer DJ DDJ-RX that came before it, and the channel switches have been moved to the top of the mixer instead of the front of the controller, which makes them much more reachable. 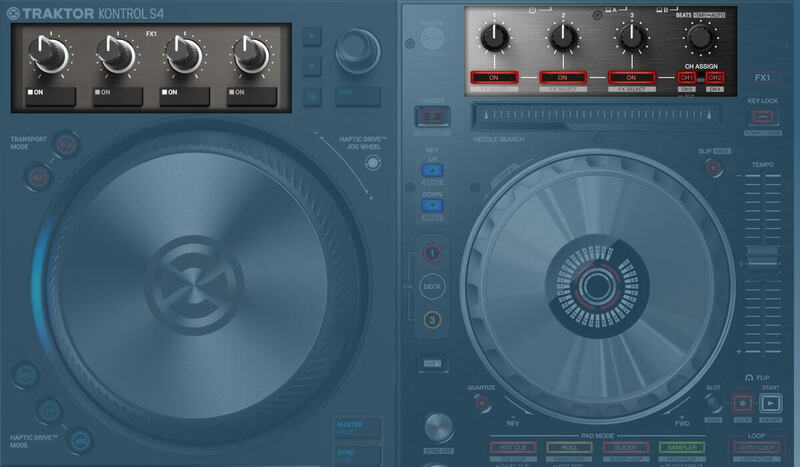 There is also a dual-tone color scheme that clearly sets the two decks and the mixer apart. The feature set of the DDJ-SX3 is very rich, from the 4 channel DVS enabled mixer to the fantastic aluminum jog wheels, the controller has two USB inputs, 3 microphone inputs, and a large number of other inputs & outputs, the SX3 is perfectly suited for the working, mobile DJ. The Traktor Pro S4 MK3 is the new flagship DJ controller from Native Instruments. It works with the new Traktor Pro 3 software and has spinning jog wheels with haptic feedback. The built-in screens are a big help as well. 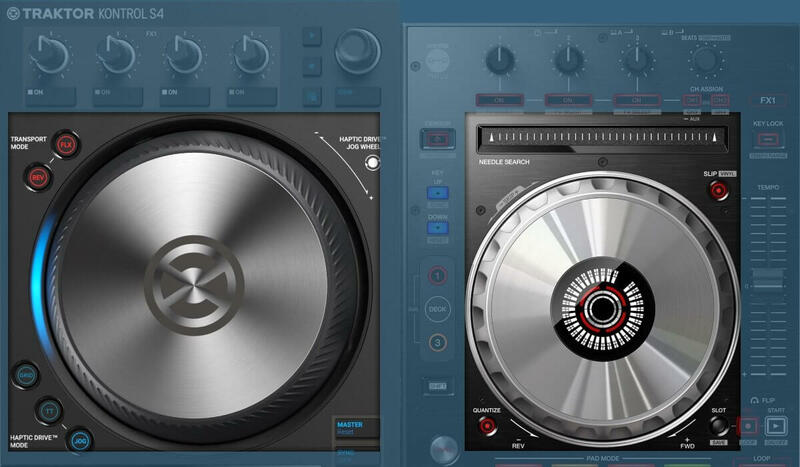 The Native Instruments S4 MK3 is a brand new update to the original S4 and the S4 MK2. In fact, it’s more than an update, as a lot of things changed. The decks are now no longer mirrored, creating a more “2 decks and a mixer” vibe. The jog wheels now spin around and have haptic feedback, and that should result in a more natural experience when DJing, without the need to check your screen when setting cue points. The decks also have an onboard small but high-resolution LCD screen detailing a lot of track information, including the track’s waveform. Finally, the mixer has 4 buttons that can call custom-set effects, and are controlled by a big filter knob on each channel. Very comparable to Pioneer DJ’s sound color effects. The effect sections of both controllers are pretty similar, with the main difference being that that on the DDJ-SX3, the deck switches for each FX module are located on the deck themselves, while on the S4 MK3, these buttons are located above the mixer channels. Both have 4 knobs and 4 buttons, 3 to control the wet/dry parameter and on/off setting of each FX module and 1 to manage the beat setting. The effects are of course those of Traktor Pro 2 (or 3) versus Serato DJ Pro, and these are in both cases of very high quality, with the Traktor Pro effects maybe having the edge. TIE Both effect sections are so comparable that it’s hard to make a choice. In both cases, the effect sections have all the necessary controls to manage 3 effects at the time, and that what I expect at this price point. The jogs on the DDJ-SX3 are basically the same as on the previous generations: large, aluminum jogs with the typical central LCD screen that shows the needle position, hot cue point display and slip status. The jog wheels are solid and are well weighted, making them very useful for scratching and backspinning. Nudging tracks is also a breeze since these jogs are large and high enough to do that comfortably. The DDJ-SX3 also has a touch strip, which makes it even easier to find a specific point in a track. The S4 MK3 has a few interesting innovations built into the jogs. The most important one is the haptic feedback: this makes it possible to feel your cue points passing by, and thus set your cue points in a much more intuitive way. Not only that, the jogs actually spin, giving you a real turntable feeling when playing. You can set them to 3 different modes, one is for adjusting grids, the second one is the turntable mode with spinning, and the third is the traditional mode without the spinning jog. There are also buttons to set the jog in reverse, and also one to activate the FLUX mode, which is similar to the DDJ-SX3’s SLIP button. S4 MK3 The DDJ-SX3’s jogs are great as they always are on Pioneer DJ controllers, but the S4 MK3 takes the win here simply because of the innovative features that bring the best of the past (spinning turntables) together with today’s technology that we know and are used to (haptic feedback) to bring something new to the DJ world. The performance pads of each controller are shaped by the choice of DJ software they support. 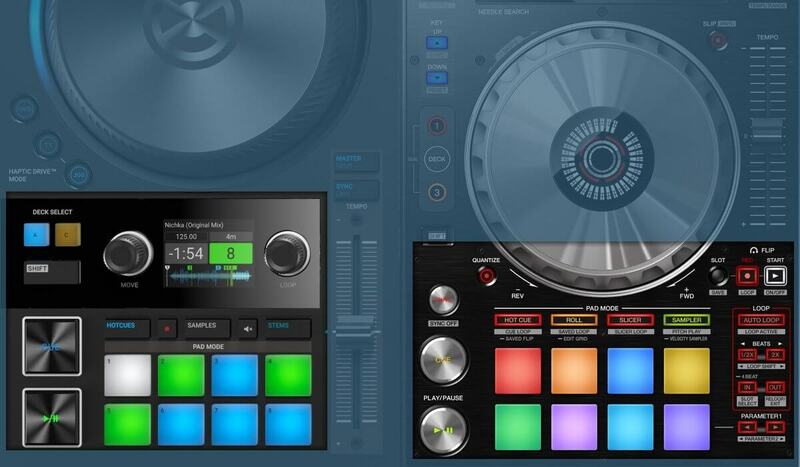 The S4 MK3‘s performance pads support hot cues, samples, stems and remix decks. The pads are basically the same as on the Traktor Kontrol S5 and S8 and thus are of very high quality. The LCD screen is extremely handy as it shows a lot of track and performance info. For loops, there is a single loop encoder knob that, in my opinion, works very well but is less refined than the more detailed loop controls on the DDJ-SX3. Finally, the cue and play button are much improved compared to the older models, now bigger and set one above the other at the left side of each deck. The DDJ-SX3 has definitely the upper hand in the performance section. As with the S4 MK3 there re 8 performance pads per deck, There are in total 8 performance modes: hot cues, roll, slicer, sampler, cue loop, saved loop, slicer loop, and pitch play. There are dedicated buttons to use Serato’s Flip function and an extensive loop section with autoloop button, beat size change buttons and manual IN and OUT buttons. DDJ-SX3 because Serato DJ Pro simply has a more robust performance feature set so there are more features supporting this on the DDJ-SX3. That being said, if you are interested in using Stems and/or Remix decks in your sets, the S4 MK3 is your only possible choice. Then we move to the mixers. It’s clear from putting both mixers side to side that the DDJ-SX3’s mixer has a slightly busier design but at the same time with more space between the channels. The DDJ-SX3‘s mixer is, in my opinion, a huge improvement over the DDJ-SX2 because of two improvements: the inclusion of sound color effects and the relocation of the channel switches to the top plate. The latter makes it so much easier to switch the channel source, especially in tight and dark club booth environments. Especially because the SX3 has two USB ports, if you are switching between DJ’s being able to clearly see to which USB port each channel is assigned is a big plus. 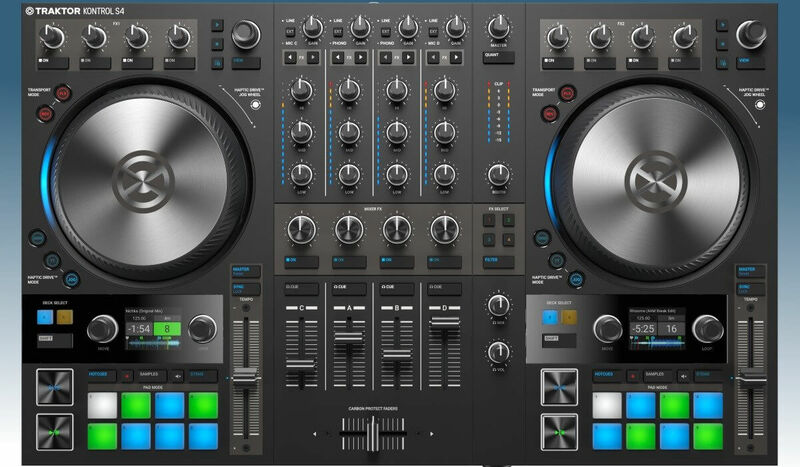 There is a central library knob with navigation buttons and buttons to select which USB port the controller should user, USB A or USB B, and all the other things you expect from a professional grade Pioneer DJ mixer are there: 3 band EQ, sound color rotary knob, master and both controls, crossfader assign switches and of course, clear VU meters and high-quality faders. Unfortunately, the headphone volume a mix knobs are still on the front instead of the top plate, which makes them less easy to reach. But since you don’t really need to see the knobs in order to tweak the headphone volume and mix, this is less of an issue. The S4 MK3 then. 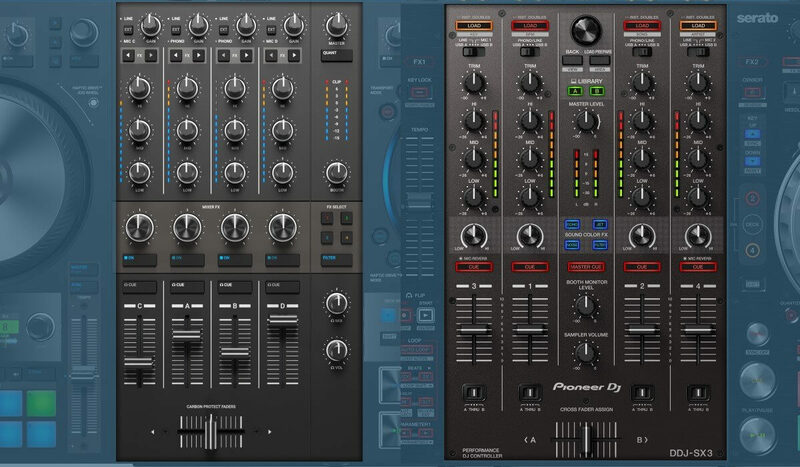 The mixer has been completely redesigned compared to the S4 MK2. The most important change is the inclusion of mixer effects: 4 programmable buttons that can carry a selection of Traktor Pro 3, with a button to switch the filter on and off. Each channel has a large knob that controls or the filter, or 1 of the 4 effects. There are also effects on/off buttons per channel, which makes it possible to activate or kill an effect without having to turn the knob. This is comparable to the sound color effects on the SX3, with the difference that the sound color effects buttons are hardwired to 1 specific effect and the filter is own of the effects. All the other buttons, knobs and faders are high-quality, with the cue button and effects on/off knob being large and rubbery, which makes them quite comfortable to use. TIE again! It’s hard to choose between both mixers, so I won’t. Both mixers have their merits, but one thing is constant with both: these are excellent mixers that are build to high-quality standards. Both support DVS with their respective supported software packages and have onboard effects for added creative possibilities. Looking at the inputs & outputs of each controller, it’s clear that both are extremely well equipped and very similar. The S4 MK3 has 2 microphone inputs, one on the front and one on the back. Both are controlled through the outer mixer channels, channels C & D. This means that you can use the filter, EQ, and effects when using the microphones, which is great, but as a consequence, you lose two channels for other audio sources or Traktor Pro channels. Furthermore, there are RCA, XLR master outputs, and a TRS booth output. Each channel has its own RCA input, with channels A & B intended for line or input. Finally, there are jack and mini-jack headphone inputs on the front. The DDJ-SX3 is pretty similar in inputs & outputs. In the mic department, the DDJ-SX3 has, next to microphone inputs routed through channels 3 and 4, an extra microphone input on the front with separate volume and on/off switch. This means that even if you have all four channels connected to audio sources, you can still use a microphone. This is an advantage over the S4 MK3. The DDJ-SX3 has a similar array of inputs and outputs when compared to the S4 MK3: XLR and RCA for master out, TRS for booth out. 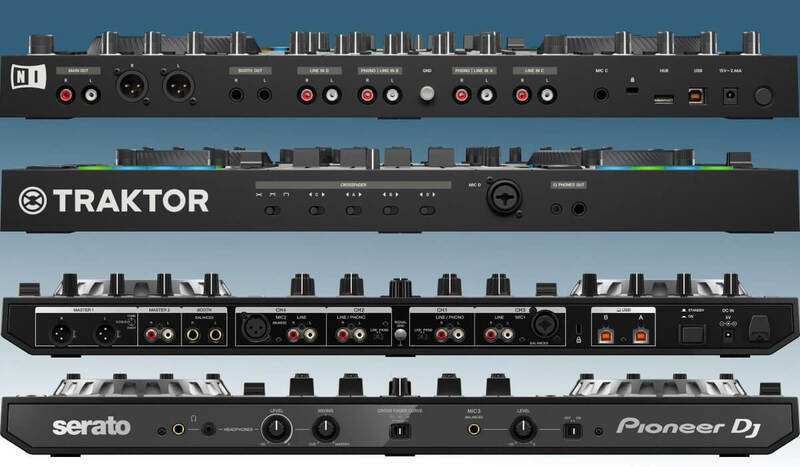 There are also 4 RCA inputs per channel, with channel 1 & 2 optimized for Line and Phono and channel 3 and 4 also equipped with mic inputs. Finally, there are two USB inputs to connect 2 computers at the time. DDJ-SX3 The SX3 has an unbeatable array of inputs & outputs. The S4 MK3 comes close, but the SX3 has double USB inputs and a third microphone input which ads an extra amount of flexibility that can make a difference for professional DJ’s in mission-critical situations. 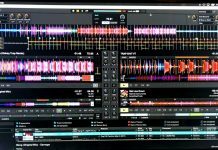 Serato DJ Pro and Traktor Pro 3 are very different pieces of DJ software, but they have some things in common as well. Both have been around for a while (Traktor Pro 3 is based on Traktor Pro 2) and developers have had the time to make it stable and reliable. Both packages support a vast amount of effects, which are of very high quality. Also, both have support for 4 virtual decks and support DVS. When it comes to interface, there is a significant difference between both: Serato DJ Pro displays waveforms in a stacked view, both horizontal and vertical, and the round spinning virtual decks are a big part of the deck design. 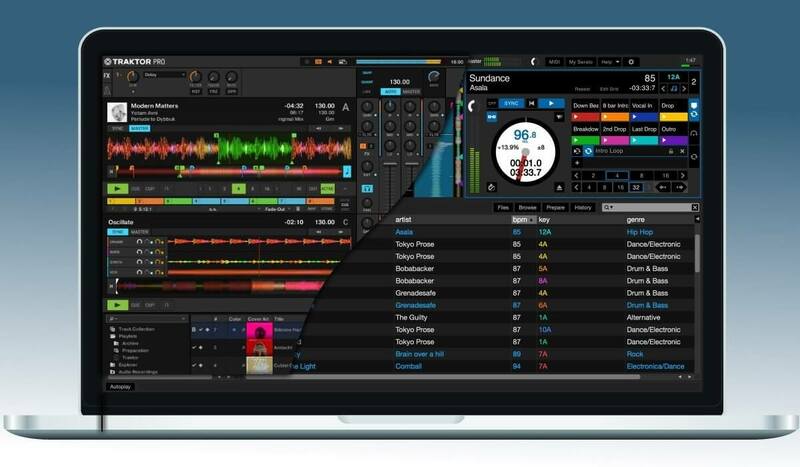 This is not the case in Traktor Pro 3, the decks and waveforms are displayed next to each other. 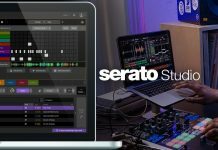 Serato DJ Pro is, functionality wise, much more oriented towards DJ’s that want a big bag of tricks to play around with, typically something you can see a lot with scratch DJ’s. The vast amount of performance modes supported by the pads, the beatgridding that is optimized for tracks with variable BPM (as is often the case with older hip-hop music, but also with funk & disco), the parallel waveforms and the DVS support are all indications of this. 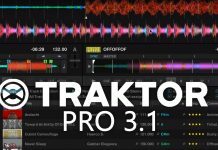 Traktor Pro 3, on the other hand, is very popular with DJ’s that play house, techno, and other electronic genres because it’s designed much more to work with automatic beatgridding and sync. 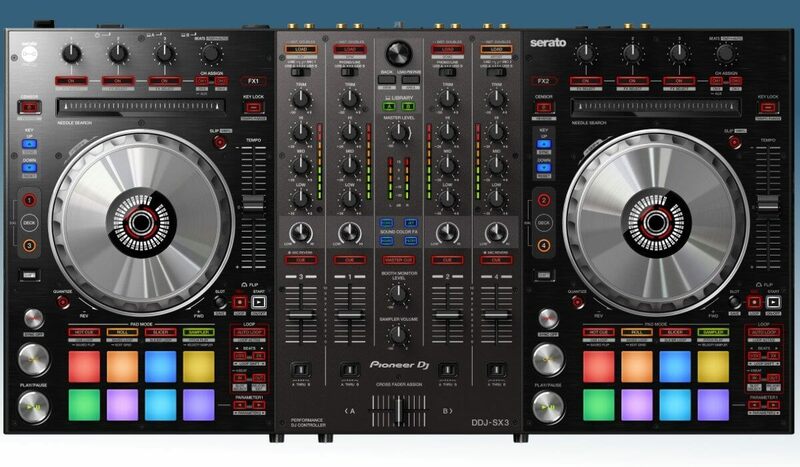 The Remix decks and stem decks notably are features that will be very hard to use without the sync button, and while the S4 MK3, unlike the S8 and the S5 has jog wheels and pitch faders I suspect that manual beatmatching will be a little bit more comfortable when using the DDJ-SX3 with Serato DJ Pro than the S4 MK3 with Traktor Pro 3. It’s important to note that both packages offer a lot of value for the money, so trying to reach a decision on which one is the best is not an easy task. Pioneer DJ DDJ-SX3 versus Native Instruments Traktor Kontrol S4 MK3: the winner! The DDJ-SX3 edges out the Kontrol S4 MK3 in this comparison. The target audience for these controllers are professional DJ’s that do mobile work in clubs, weddings and parties and I feel that the DDJ-SX3 is just that little more “hands-on” and practical for these DJ’s. For the price, you get a mixer that can run Serato DJ pro in internal mode on two channels, have another laptop connected running Serato DJ Pro in DVS mode with turntables on the two other channels and still have the possibility to hook up a microphone at the same time. The S4 MK3 has very interesting features and surely innovates on a few fronts (haptic feedback, mini LCD screens…) but overall, the DDJ-SX3 has, in my opinion, the most bang for your buck! What are your thoughts? Do you prefer the DDJ-SX3 over the S4 MK3 or the other way around? And why? Comment below! Denon DJ MCX8000 VS Pioneer DJ DDJ-1000: Which Is The Best? Pioneer DJ DDJ-SB3 Versus Pioneer DJ DDJ-400: Which One To Buy? Mixtrack Platinum VS DDJ-RB VS DJControl Jogvision: Which One Wins?